Introduction: In 1958, Hollywood produced The Vikings, a blockbuster featuring first-rank stars like Kirk Douglas, Tony Curtis, Janet Leigh, and Ernest Borgnine. The director, Richard Fleischer, wanted the utmost authenticity, so he filmed the action in the fjords of Norway. One of the intriguing aspects of the film’s visuals was the rolling credits at the beginning and end of the movie for which the Bayeux Tapestry served as the basis. 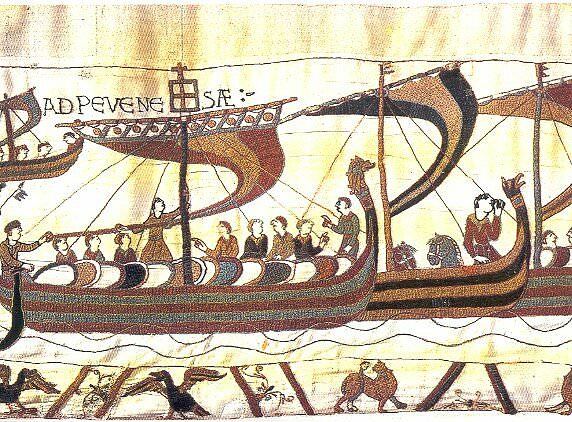 Images closely adapted from the Embroidery prepare the audience for the story to come: Viking ships on their way to attack England, where the king sits enthroned, and the clergy pray for protection from the savagery of the Northmen. In the final credits, there are many more borrowings from the Tapestry. It is interesting that none of the credit images are based on the actual battle sequences in the Embroidery and that there is no reference to the Bayeux Tapestry as the source of the imagery. In the movie itself, there is a wall hanging in the Viking leader’s hall, suspended behind the feasting table. This hanging, while not borrowing images from the Bayeux embroidery, is about the same proportions and format – a long and narrow strip with a central frieze and upper and lower borders. How did the Bayeux Tapestry, with its images of Normans and Englishmen, come to be so strongly equated with the legendary Vikings in the popular imagination? And in the United States, where familiarity with medieval European history and art is not one of the major concerns of the school curriculum? Perhaps the designer of the movie’s credits had visited Bayeux in the 1950s and, having seen the Tapestry when it was exhibited in its former home in the Bishop’s Palace, decided it would serve his purpose. Perhaps he was familiar with a book on the Bayeux Tapestry, something like the comprehensive study edited by Sir Frank Stenton which first appeared in 1956. We will never know if he was aware of the long and convoluted history which links Scandinavia, the Vikings, and the Bayeux Tapestry. The question of the relationship between Scandinavia, the Vikings, the Norman Conquest of England, and the Bayeux Tapestry, has been discussed from the viewpoint of archaeology and art. It is equally necessary to investigate it from the standpoint of national attitudes and interests, for it is possible to interpret the Bayeux Tapestry, the Anglo-Saxons, and the Vikings as nineteenth-century century creations. The ways we look at these phenomena and the questions we ask of them were formulated during the post-Napoleonic period when national identity was a major concern, and many European countries were reconstructing their own early histories.